Hardcover, 6.75 x 9.5 in. / 160 pgs / 74 color / 26 bw. Edited by Lionel Bovier, Clément Dirié. Preface by Larry Bell. Text by Marie de Brugerolle. Afterword by Gérard Wajcman. Now back in print, this volume is the first overview of the French-born, Los Angeles–based artist Guy de Cointet (1934–83). De Cointet was fascinated with language, which he explored primarily through performance and drawing. His practice involved collecting random phrases, words and even single letters from popular culture and literary sources—he often cited Raymond Roussel’s novel Impressions of Africa as influential—and working these elements into nonlinear narratives, which were presented as plays to his audience. De Cointet is one of the major figures in Los Angeles’ Conceptual art movement of the 1970s, having strongly influenced a number of prominent Los Angeles–based artists, including Paul McCarthy and Mike Kelley. 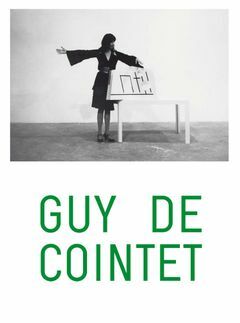 The book, written by Marie de Brugerolle and published with the Estate of Guy de Cointet, offers an overview of this enigmatic and influential oeuvre. FORMAT: Hbk, 6.75 x 9.5 in. / 160 pgs / 74 color / 26 b&w.